Active Critical Care Liquid Protein Nutritional Supplement, by Medline, is a protein supplement that is pre-mixed, ready to drink, either orally or through a feeding tube. The drink comes in a citrus/berry mix to make it easier to consume as it is sweet to the taste. The concentrated mix of protein in small volume doses to make for quick, economic feeding. 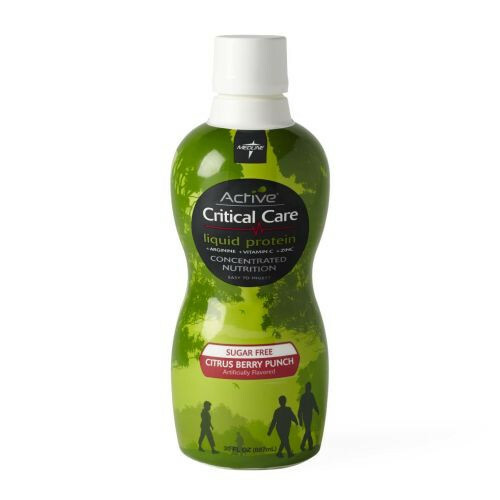 The Active Critical Care Liquid Protein nutritional drink is sugar-free, yet contains essential components for cells lacking protein and sometimes needed for woundcare and for the body to achieve proper healing. Active carries 21 grams of protein in just 30 mL of the nutritional food solution. In addition, it has 3.7 grams of Arginine, an essential amino acid. This is a drink that needs to be supervised or directed by a healthcare professional. Active Critical Care Liquid Protein Nutritional Supplement is only intended for those with specific protein deficiencies and is not meant for dieting or weight loss. It comes is a case of four 30 ounce bottles. Active is shelf stable and does not require refrigeration. The supplement fortifies the patient with protein and the amino acid Arginine. It is highly concentrated so only small amounts are typically needed. It is sugar free and delivers less calories. The drink is flavored to make it more palatable. It can be administered orally or through a feeding tube.